Le nombre d’actes antisémites ayant donné lieu à un dépôt de plainte est passé de 808 en 2015 à 335 en 2016. Soit une baisse de 58%. The number of Antisemitic acts that led to filing a complaint declined from 808 in 2015 to 335 in 2016, a 58-percent decrease. Rolling out a plan of stationary protection across France via Operation Sentinelle most probably contributed to this significant and rapid decrease. Intermediate and long-term effects of government-led plans against racism and Antisemitism have raised high expectations for reducing the number of still numerous racist and Antisemitic acts. 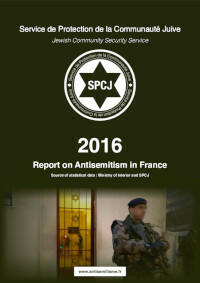 -Extreme violence and terrorism that targets Jews in France often overshadows 'everyday' Antisemitism. Numerous victims of Antisemitic verbal attacks or light violence no longer file a complaint. They have grown accustomed to a phenomenon that has been trivialized. Antisemitism has reached such extreme proportions that 'weak instances' of it are no longer denounced, even though they remain serious and inflict terrible consequences. - 1 out of 4 racist acts committed in France in 2016 targeted a Jewish person, while Jews represent less than 1 percent of the population. - For several years, Antisemitic propaganda and speeches have shifted from old media to the Internet. To this day, a thorough census tabulating calls for Antisemitic hate or violence has not yet been conducted. can a crime be condoned by another crime?